Of course it’s curious that the clinic didn’t address the issue while admitting Barbara’s CH cat, but I’m glad to see that they were honest in that they didn’t feel they could monitor him closely while under anesthesia. Now, while CH cats can be put under anesthesia, there are a few things to keep in mind. First, it’s absolutely essential for everyone who will be working on your cat to know he has cerebellar hypoplasia. This is essential for your vet and his staff to be aware of any brain disorder prior to surgery. This may mean that the clinic you had in mind for your cat’s surgery may not feel confident in their ability to monitor a CH cat under anesthesia. This is OK, as I’m sure we’d all rather be safe than sorry. Second, there are some types of anesthetic that are recommended, and others that should be stayed away from. According to CHcat.org, gas anesthesia, like isoflurane or sevoflurane, is best for CH cats. It allows them to recover more quickly, so there’s less of a risk of unpleasant side effects. The site recommends that ketamine should be avoided as it can stay in your cat’s system for a while and can make recovery unpleasant. CHcat.org also recommends that your vet place an IV catheter and intubate your cat during surgery, along with monitoring your cat’s blood pressure level constantly. If you don’t know if your clinic of choice will adhere to these standards, take a moment to chat with them. 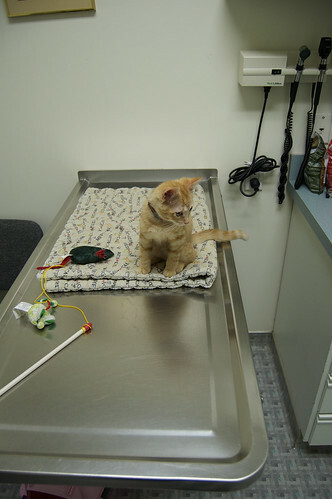 Prior to the surgery, speak to the folks at the clinic and ask any questions / voice your concerns, while making sure that everyone knows that your cat has CH. Even once you bring your cat to the clinic to be spayed or neutered, you may want to put a card like this on the outside of his carrier. Another option is to take a piece of masking tape or bandage tape, stick it to the front of the carrier, and on it write “I have Cerebellar Hypoplasia.” That way everyone who comes in contact in your cat (at least while he’s with his carrier) will know about his condition. 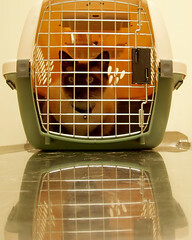 There are also a number of post-surgery tips for CH cats you should keep in mind. Most of the tips are similar for normal cats, but you may want to take extra precautions, just because you never know when a wobbly cat’s fall will tear open stitches or make a situation worse. Click here to find a CH friendly vet near you. I am currently having the same problem. We adopted two kittens from a shelter in October – one with CH and one without (brothers) The low cost clinic wants us to go get a neurologic consult before they will do surgery. I just spent over $500 getting my CH guy healthy (he had NASTY ringworm and parasites) and I am not spending thousands for more tests to tell me that he has CH and nothing can be done for it.